USES: Hyoscyamine is used to treat a variety of stomach/intestinal problems such as cramps, infant colic, and irritable bowel syndrome. It is also used to treat other conditions such as bladder and bowel control problems, cramping pain caused by kidney stones and gallstones, and Parkinson's disease. In addition, it is used to decrease side effects of certain medications (drugs used to treat myasthenia gravis) and insecticides. This medication works by decreasing acid production in the stomach, slowing down the natural movements of the gut, and relaxing muscles in many organs (e.g., stomach, intestines, bladder, kidney, gallbladder). 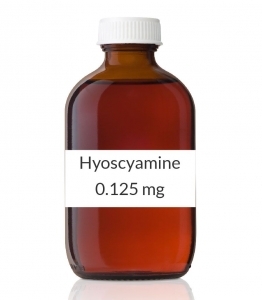 Hyoscyamine also lessens the amount of certain body fluids (e.g., saliva, sweat). This medication belongs to a class of drugs known as anticholinergics/antispasmodics. HOW TO USE: Take this medication by mouth as prescribed, usually 30-60 minutes before meals, or as directed by your doctor. Use the dropper that comes with this product to measure the dose out carefully. Dosage is based on your medical condition and response to therapy. In young children, the dosage is also based on weight. Do not increase your dose or take it more often than prescribed without consulting your doctor. Adults and children 12 years and older should not take more than 1.5 milligrams in 24 hours. Children aged 2 to 12 years should not take more than 0.75 milligrams in 24 hours. Ask your doctor or pharmacist for more information. Antacids lower the absorption of hyoscyamine. If you use antacids, take them after meals and take hyoscyamine before meals; or take antacids at least 1 hour after taking hyoscyamine. Drink plenty of fluids while taking this medication unless your doctor directs you otherwise. Inform your doctor if your condition persists or worsens.